Canadian tangler Judy Murphy shares her Double D’s pattern with us today, and my humble example doesn’t begin to touch on the possibilities with this one. 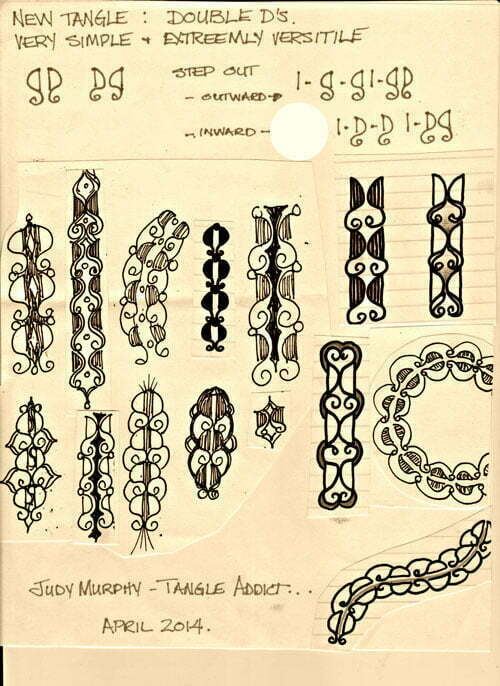 As with her AA’s pattern, Judy experimented with a letter of the alphabet and came up with this new tangle pattern. Judy illustrates the step-by-step instructions for drawing Double D’s below and shows a variety of ways to vary this easy tangle. I tried out many of Judy’s examples and then did a little experiment of my own by offsetting the curly-tailed D’s in opposite directions. Whether you like the DG or the GD versions (the mantra I used while drawing it because my brain was fighting reversed Ds for some reason), this is a fun one to experiment with. I am enchanted by your examples,Thanks for sharing it with us! I can’t wait to try it. This is really neat! I love all the examples you gave! Interrest Double D’s great examples. This would make a beautiful boarder. I like the variation of the patterns, very nice. Thank you for sharing. The Double Ds are a delight. Thank you…thank you. I like the double d’s tangle. I tried it and am posting it on my site.